New legislation aims to increase rural broadband access, but significant challenges remain. Internet access is a tale of the haves and the have-nots. For many, it has completely changed the way we live, instantly making just about any type of information available at our fingertips. However large parts of the country remain unconnected, without access to the high-speed broadband most take for granted. In Georgia, the Federal Communications Commission (FCC) estimates that about 9 percent of the state – about 943,000 people – doesn’t have access to broadband, which it defines as minimum speeds of 25 megabits per second (Mbps) for downloads and 3Mbps for uploads. While lacking high-speed internet access may seem like a thoroughly modern problem, it’s not that different from challenges rural areas faced in the past. It’s an issue Gooch and rural Georgia leaders have been trying to tackle for nearly a decade. They hope the Achieving Connectivity Everywhere Act (SB 402), signed into law by Gov. Nathan Deal in May, might finally start to close Georgia’s digital divide. How many areas in a community does reliable, high-speed internet access touch? It might be easier to say what it doesn’t touch. School systems across the state are going digital, trading textbooks for laptops and handwritten homework for digital assignments. In healthcare, telemedicine continues to expand, offering a virtual solution for the lack of providers and hospitals in rural areas. In agriculture, remote monitoring and water management technology help farmers grow their crops more efficiently. And businesses – both brand new and established – depend on the internet to break into local and international markets. Throughout the country, it’s a similar story: It’s expensive to run fiber optic cable to remote, sparsely populated areas – too expensive for major providers to justify. Few potential subscribers equals an abysmal return on investment. “That’s a good business decision if you look at it strictly from economics and dollars and cents,” Gooch says. “The challenge for us was how to incentivize private companies to go out and build their infrastructure into the rural areas of the state, because we need it just as badly here as they do in the urban areas. This inventory – a highly detailed mapping of broadband access across the state – will provide a much more granular view of the state’s problem spots than current FCC mappings, which count a census block as served if just one house in the entire block has service. Preliminary mapping should be completed next month, and the map will be updated continually as access status changes. The Department of Community Affairs (DCA) in partnership with the Georgia Technology Authority, is managing the mapping effort. DCA will also head up the state’s new “broadband-ready community” program to support communities in growing their infrastructures. SB 402 opens GDOT rights of way for fiber optic cable installation, which private companies will then be able to access – at a cost – to provide broadband to more customers in rural Georgia. GDOT will also be able to use the fiber optic cable to deploy its own technology, Gooch says, which could help control traffic flow, improve traffic signalization and support messaging with GDOT’s Transportation Management Center. And by selling capacity to private companies, SB 402 will create a revenue stream back to GDOT, though that amount is unknown. Private company access to right of way assets is a sticking point for the state’s major providers, says Kevin Curtin, AT&T assistant vice president for legislative affairs. “It’s a real public policy issue here in Georgia, and it’s one that we continue to work on at the local and state level to try to come up with a resolution where we can efficiently deploy wireless assets and utilize the right of way, much like all other utilities do, to deploy broadband in an efficient manner,” he says. Curtin points to the state’s lack of streamlined, statewide rules governing deployment in right of way and the cost of doing so as two policy hurdles to bringing broadband to rural areas. “The majority of states in the country don’t charge anything for broadband providers to access the state right of way. Georgia is not one of those states. It is quite expensive to access the state right of way for broadband in Georgia,” he says, citing fees in the range of $1,000 to $5,000 per linear mile per year. State access issues aside, Georgia’s rural leaders are open to working with service providers on right of way issues when possible. In South Georgia, Colquitt County Administrator Chas Cannon is willing to work with private companies to get reliable, high-speed access to his citizens. Cannon estimates about 45 percent of his county is without broadband access, with greater numbers further out from the cities to unincorporated areas. For Colquitt County, broadband access is the difference between staying competitive and lagging behind the rest of the state. There’s a fork in the rural road to broadband – wired access via fiber optic cable and wireless access via 5G small cell technology. Wired access, with its direct fiber optic connection, can offer industry-leading speeds and reliability. But, again, its cost has made it prohibitive in rural areas. Wireless access, however, is seen by some providers and small communities as a cost-effective way to overcome topographical challenges, and it eliminates the high cost of running cable to homes. But, its speeds are slower (10Mbps/1Mbps for AT&T’s fixed wireless product, for example), and its transmitters, cabling and equipment would still need to be run close enough to homes for them to receive the wireless signal. Whether it closes the cost gap enough to effectively serve the most remote areas has yet to be seen. 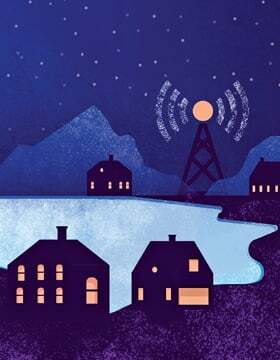 AT&T, through the FCC’s Connect America Fund, will bring its fixed wireless product to 67,000 rural homes in more than 50 counties across the state by 2020. Comcast, the state’s largest internet provider, connected more than 244,000 Georgia residents to its 15Mbps/2Mbps cable Internet Essentials service from 2011–2017, and is focused on network expansions in rural areas including Dawson and Jackson counties. Meanwhile, in Haralson County, the government has turned to Calhoun-based iWispr to bring wireless access to remote citizens. “When I first took office back in 2005, one of the most [common] complaint calls that I received was the lack of internet accessibility for the county. And keep in mind, we are only 45 miles west of Atlanta, about 110 miles south of Chattanooga and maybe 90 miles east of Birmingham,” says Haralson County Board of Commissioners Chair Allen Poole. About 60 percent to 65 percent of the county doesn’t have broadband access, Poole says – equating to nearly 20,000 people. The county’s rolling topography complicates running fiber to each home, but Poole sees wireless as a cost-effective way to connect his citizens. Using Special Purpose Local Option Sales Tax (SPLOST) funds, the county partnered with iWispr to make infrastructure improvements. iWispr should begin offering service by late summer 2019, says Poole, with coverage ranging between 92 percent to 94 percent of the county. “We’re trying to make it easy for iWispr to come in and provide this service that the citizens have requested, yet we walk a thin line to make sure that it’s open to any other provider if they choose to do so,” he says. Keeping options open for all types of providers is another of Gooch’s focuses. SB 426, which didn’t pass in last year’s legislative session, would have allowed electric management companies to provide internet access to their remote customers. “We can’t take any tools out of the toolbox on this effort,” he says. Looking forward, there’s still a lot that remains to be seen in tackling the tangled issue of remote broadband. Though there are a lot of unknowns still in expanding broadband to the state’s most remote areas, SB 402 provides a preliminary roadmap – and allows the state to get a clearer picture of the challenges it faces and where those challenges are the greatest.